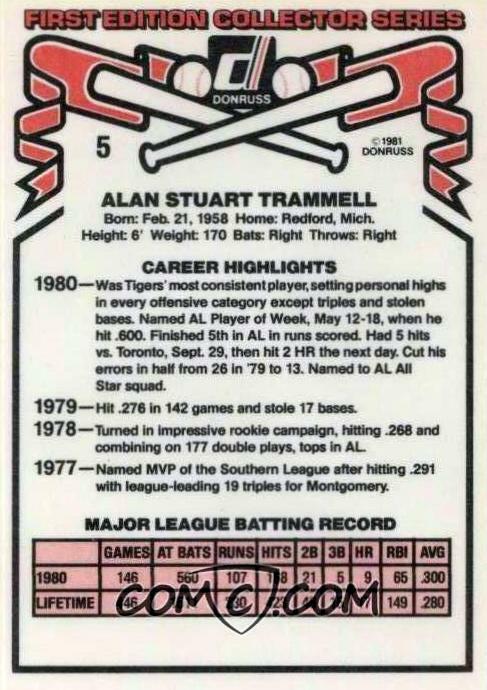 Happy 55th birthday to Alan Trammell! He appeared as #5 in Donruss's debut baseball set, who joined Fleer in finally pushing Topps off their MLB monopoly mountain in 1981 after attempts by others throughout the 60s and 70s came up short. Is that big-eyed look surprise or intensity? Did the photographer jump Trammell in the middle of pre-game warm-ups? Is Alan is defending himself with that bat? I collected 1981 Donruss fresh from packs as a youngster and burned much midnight oil reading their chronological highlights. Even basic evaluations like "was Tigers' most consistent player" set a context for pre-Internet fans who rarely (if ever) saw games outside their home city. "A shortstop who's also his team's most consistent hitter? I would trade my whole infield for that guy!" Trammell holds a special footnote in collecting history because his solo Rookie Card comes not from Topps, where he shares the bill with Paul Molitor, but Burger King's 1978 Tigers set. His #15 shows off the crisp and classic Tigers home uniform, complete with matching undershirt, a great piece of cardboard for team or type collectors (full 1978 set profile). TRIVIA: On Sept 24, 1982, Alan scored the winning run in baseball's longest game decided by a wild pitch (18 innings). 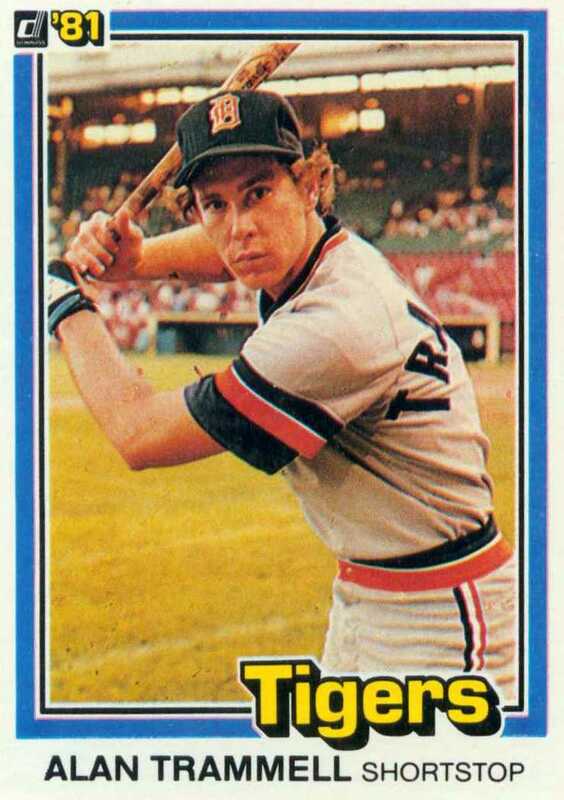 Value: 1981 Donruss cards come cheap, so this #5 costs less than $1. Fakes / reprints: I doubt anyone would make money faking 1981 Donruss cards, but it's possible promotional reprints exist.